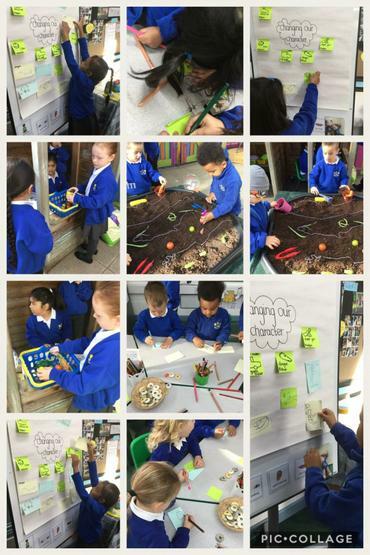 This week we have been exploring everything Easter! 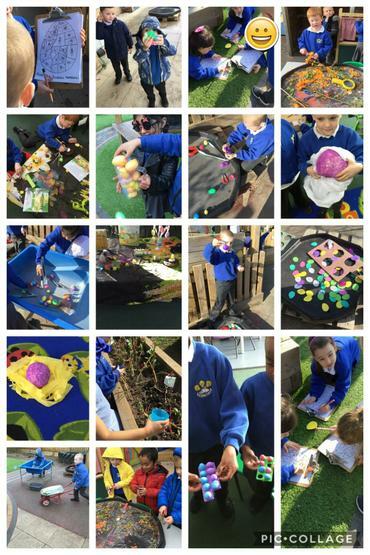 We have hunted in the garden for number eggs, we hunted on the playground for sound eggs, we acted out Easter scenes with the Easter animals, we made Easter cards and loads more! 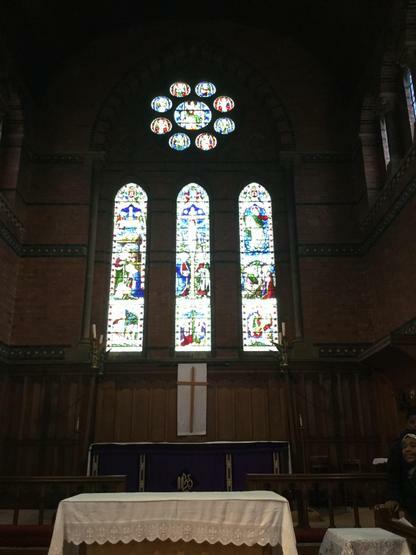 We visited the church and sang lots of songs and heard the Easter story. Thank you to all of our grown ups who joined us for our show case on Wednesday afternoon. The children enjoyed performing Jack and the Beanstalk to you and sharing their busy time learning. What a busy week! Thank you for all of your support this term, have a lovely holiday and don't forget to update tapestry with all of your holiday adventures! This week we have celebrated our wonderful mums, we have shared special memories we have with them, why we are thankful for them and talked about what they do for us. We are very lucky! 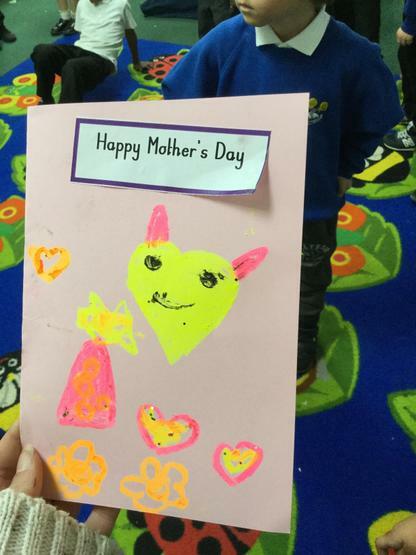 We have spent lots of time working creatively on our Mother's Day cards and are very excited to give them on Sunday. We worked hard on our messages inside of the cards and hope you like them! 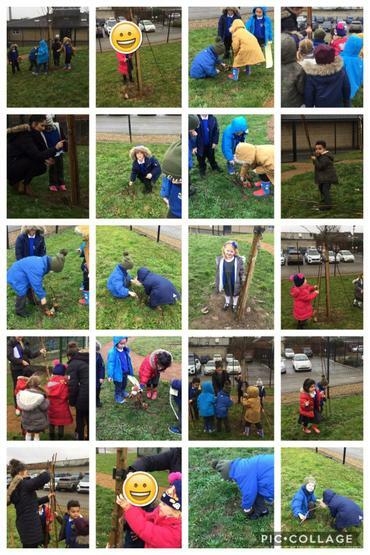 Our beanstalks had over grown their small pots, so this week we planted them into one of our flower beds, we used long sticks that we found in our garden to support out long beanstalks. We are now taking good care of them watering them every day. It was the Robin's turn to visit Argyle house this week, they explored the story of the 3 Little Pigs through music, song and dance. The rest of Robin class will visit next week! We look forward to seeing lots of parents next Wednesday the 3rd for our showcase! 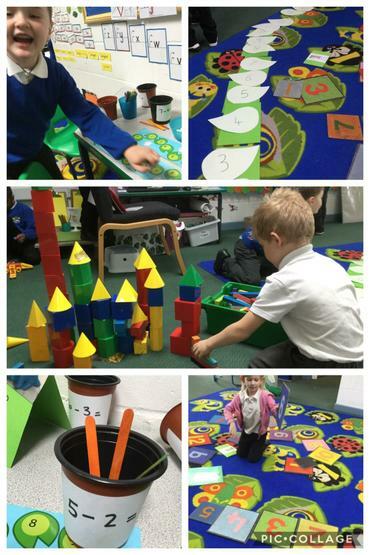 This week in reception we have been busy working with numbers and shapes. We have ordered them, sorted them, represented them and solved addition and subtraction problems too. 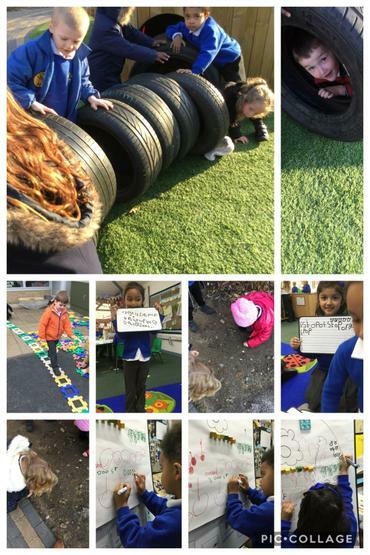 We have been trying to move our learning outside more, this week we enjoyed phonics outside using the large space to write on a big scale. 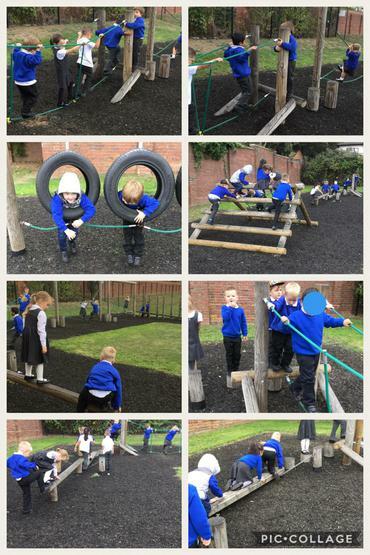 We also played find a sound on the playground. We also visited Argyle House this week, we read stories, sang songs and did lots of dancing with the residents. It will be Robin class' turn next week! We can't wait to boogie! This week we had a visit from the giant! He had enormous feet and a big belly! We asked him lots of questions about why he was so grumpy to Jack, we used this to write our descriptions about the characters from Jack and the Beanstalk. We also did a lot of measuring to see whose beanstalk was the tallest! We created castles for the giant thinking about where he would sleep and if there was enough room for him. We showed great cooperation! 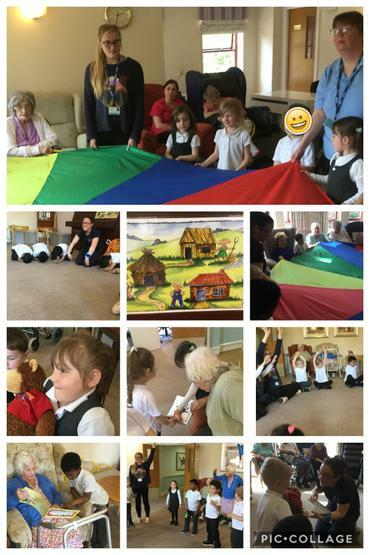 The Jay class also visited Argyle house this week and did lots of story telling and singing with the residents. We love spending time with them and sharing our learning. 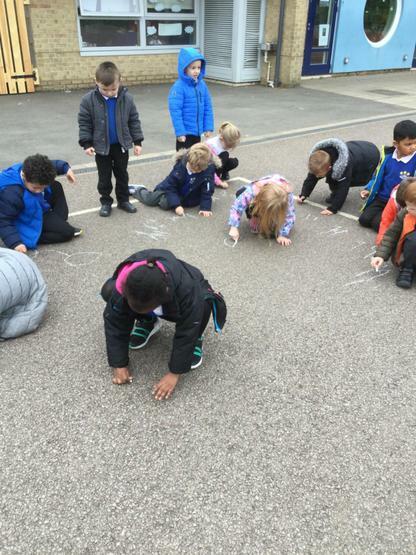 On Friday, as well as celebrating red nose day we spent the morning investigating our learning dinosaur powers. 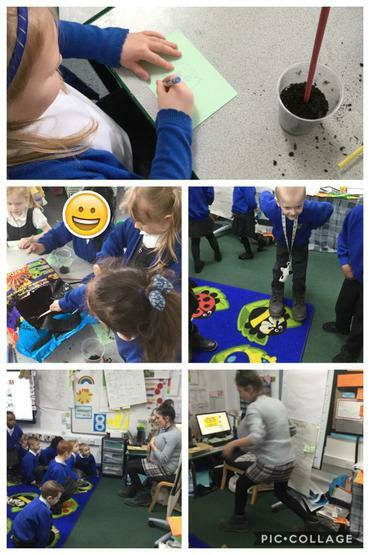 We took part in lots of different challenges and thought about how we all learn differently and the different skills we use whilst we are learning! Next week we will be diving deep into the world of maths! Don't forget to show us your number learning on tapestry too! This week in reception we were excited to discover a colossal beanstalk had grown in our school hall! Luckily we have a really strong head teacher and Mrs Beech chopped it down before we needed to eat our lunch! This got us so excited to hear our new story Jack and the Beanstalk. 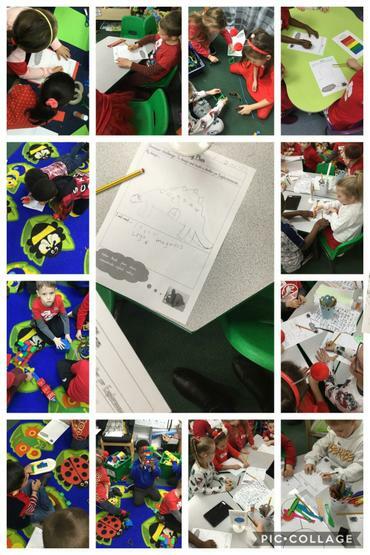 We have built tall beanstalks, measured long leaves, and created our own story maps, some of us even wrote post cards to the giant high in the sky. We also enjoyed the beautiful sunny weather and spotting the first very early signs of spring! 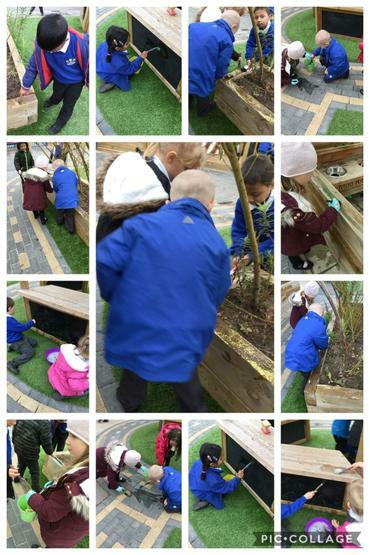 We have enjoyed using the natural resources from our garden to support our learning. 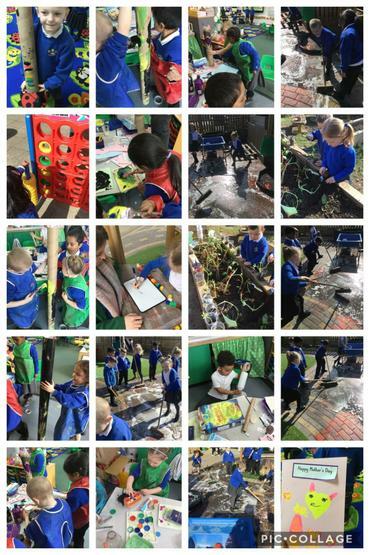 We have used sticks for pencils, counted and measure leaves and muddy footprints, made bridges over the puddles and used the stones to measure the giants footprints! We have had such a great first week back at school and we are so excited to discover more about our new story! Look out for story maps coming home next week, please remember to post any of your children retelling the story onto tapestry so we can share our learning! This week we made out own gingerbread men and decorated them! First we wrote our own instructions on how to make a gingerbread man! then we looked at all of our ingredients and spoke about what they smelt like. we took it in turns to weigh out our ingredients and mix them all together. We also innovated our story this week! We had a tasting session where we all tried new baked goods. We tasted shortbread, cookies and brioche and then voted on our favourite! We all wrote our name on a post it note and stuck it under our favourite. The winner was shortbread! So our story is now the shortbread man!! We have loved changing our story maps to our own characters, some of us used the shortbread man and others changed it to something completely different. We had the carrot lady and the lunchbox man. We really enjoy telling our stories to everybody. It also snowed this week! 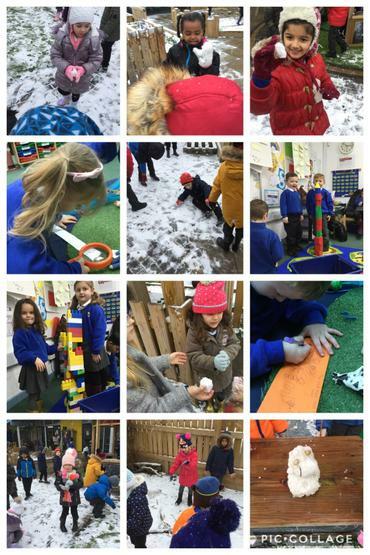 We had fun exploring the snow and we were determined to build a snow man, in which we succeeded! it's been a great week of learning and we are excited to learn all about Chinese new year next week! This week we looked closer at our story the gingerbread man. We divided it up into the things we like, the things we didn't like, things that confuse us and patterns that we noticed. We also looked at the different vocabulary and made sure we understood the meaning of lots of new words. We did this by acting out what the words meant, the word catch was our teachers favourite when we pretended to catch a fish to explain the meaning! 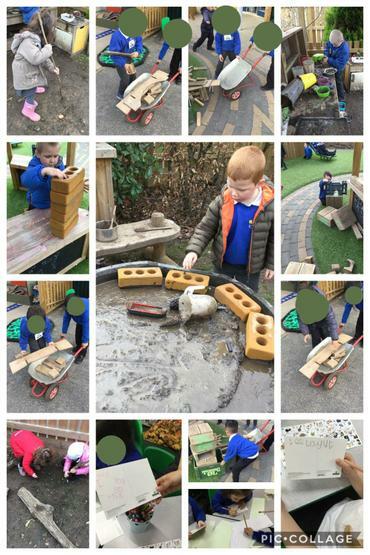 We also enjoyed taking part in our stickasaurus challange this week creating a bridge for the gingerbread man so he didn't get wet! 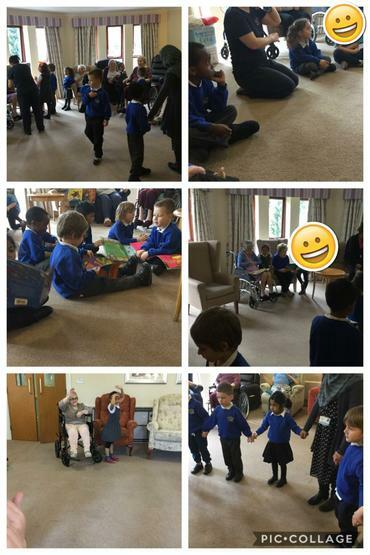 The jay class also took some time this week to go to the residential home. 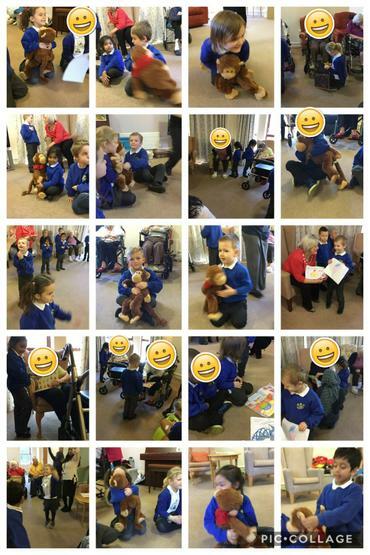 We shared lots of stories with the residents and sang lots of songs all about the gingerbread man! We had the best time!! 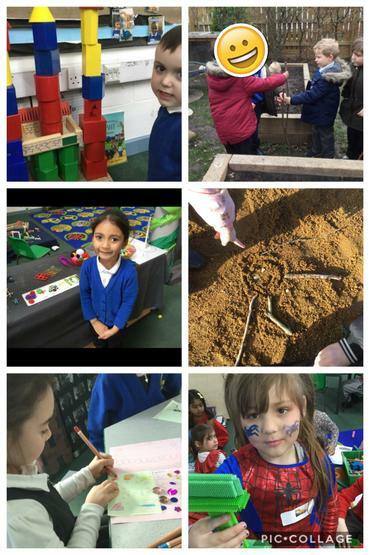 This week we also went to our forest school where we made clay faces and traps for the gingerbread man! 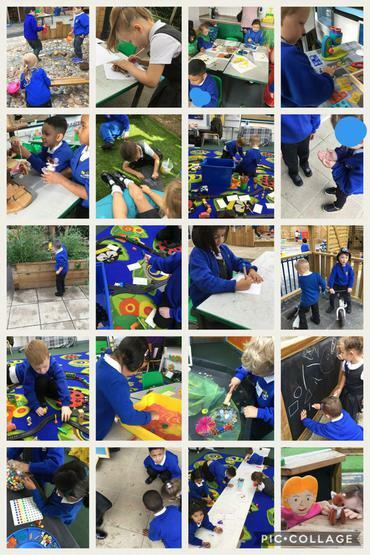 This week was the first week of our fun Fridays where the grown ups can stay and join in with a morning task or read a story. We had a few parents who joined us we hope to have more next week!! Next week we are going to be very clever and write instructions on how to ake gingerbread man. We are going to follow our own instructions and bake some yummy treats!! This week our teachers have been so impressed with how well we have come back to school. We have settled back into our daily routines wonderfully and are such confident happy children now. This week we decided to share a lovely story about the gingerbread man, we then wanted to try some delicious gingerbread. However when our teacher went to get the gingerbread men they had all gone!!!! There were none left just an empty box and a note which read, "run run as fast as you can you can't catch me i'm the gingerbread man!" We got so so excited we shouted hes ran away!! We searched all around our classroom until eventually we saw anther note on the door we all ran outside and there we found a big bowl of gingerbread men!! We ate them all up and then made a chart about which body part we ate first! We enjoyed our gingerbread men so much! Most of us ate the head first! After this we spent the rest of the week learning our new story we practiced our first part in lots of different ways, a squeeky voice, a deep voice, moving our mouths and not making a sound and as fast as we possibly could! We had lots of fun and laughing. 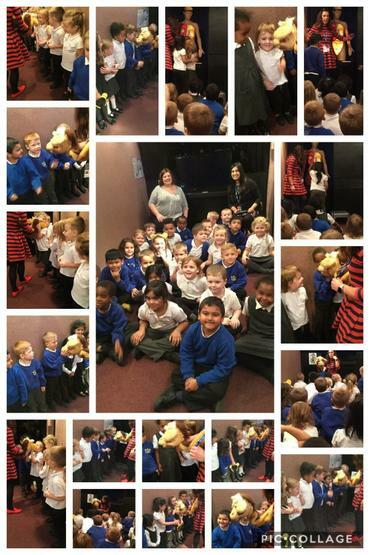 This week Jay class also went to Argyle house the residential home and sang lots of gingerbread man songs and told lots of stories with the residents. BoogieBeats helped us with all of songs and encouraged us to make new friends! It was brilliant- see twitter for a video! 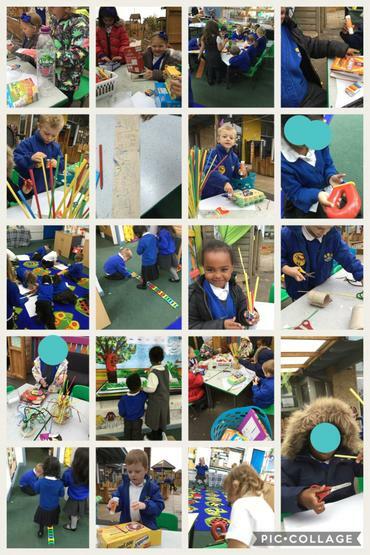 We can't wait for next week to see what other ways of telling our new story the children will invent. Welcome back to the spring term! We hope you enjoyed a relaxing break and are ready for lots more fun learning. Our topic this term is 'Once upon a time'. We will be learning lots of different traditional tales, including the gingerbread man to begin with! Please have a look at our Spring Term overview and Curriculum newsletter! This week we put up our Christmas tree! We all helped to add different decorations and we were so excited putting the big star at the top. The top of the tree was a long way up. However one of us had a great idea to solve our problem to use a chair so we could reach! 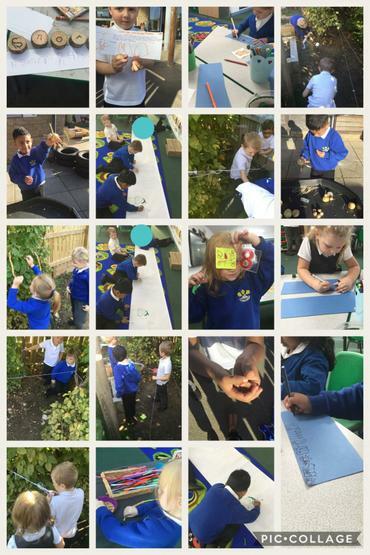 We had great fun in our garden this week, we played bowing and recorded our names and our scores so we could add them all up at the end and see who had won! We got so excited when someone got 10! 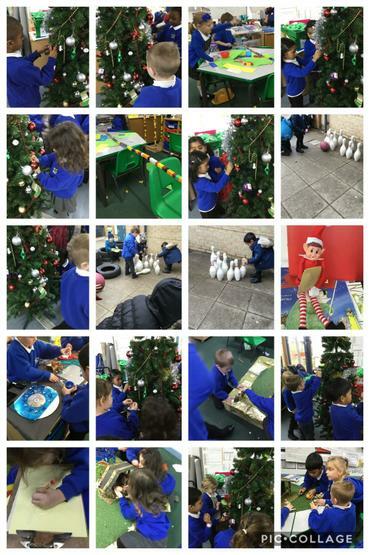 We also enjoyed creating an elf's workshop outside, we used our clever cutting skills to cut out pictures in our Christmas brochure to make toys ready for the elf's to take to Father Christmas. We also found a elf on our shelf this week!! He was a lovely elf called Eric who gave us a wonderful story all about the little red elf. We have loved learning this story and writing about it! Every day Eric writes us a new kindness act that we act out! We want Eric to stay! Next week is our nativity and we are super excited to show our grown ups how confident we all are!! We are also going to the residential home to sing lots of songs and bring Christmas cheer to everyone! Such an exciting week ahead!! This week we have enjoyed our first forest school experience! It was wet and rainy but this made it more fun, we loved making cay faces on the trees and using natural resources to create the features. 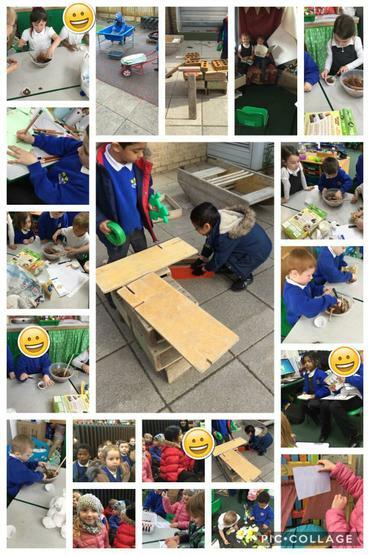 We also enjoyed building animal homes for the poor animals who were getting wet and cold in the weather. We tried to create nature crowns with all of the leaves and grass. However the wind made this a bit tricky for us, and it was very funny to watch. 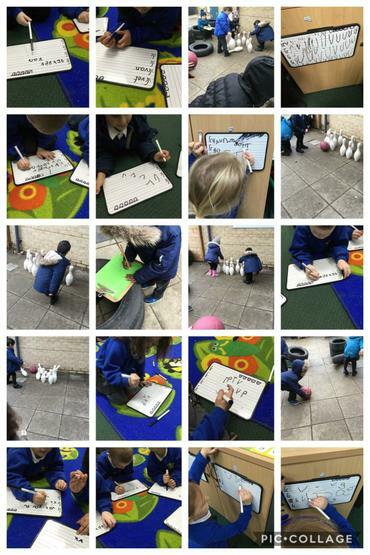 We showed of our clever maths skills this week too, we were adding! We discovered one more than a number and had a letter from Pip about her greedy granddad coming to stay. We had to help pip with her recipe and make grandads porridge, however because he was so greedy we kept having to add one more!! It was great fun. 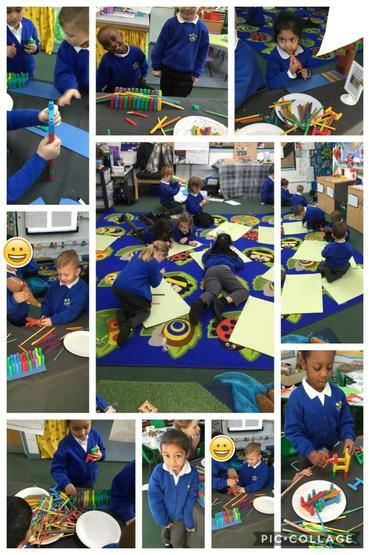 After this we showed our teachers how clever we really are by adding numbers using our cubes and representing our number problems on whiteboards. We were able to interpret and explain our numbers. Out teachers were very proud!! Today we had Christmas craft and circulated the whole school taking part in lots of different craft activities!! We are so excited to continue practicing for our nativity next week and explore Christmas even further, including why Christians perform nativity plays at Christmas time. This week we really enjoyed spending time with our grown ups. 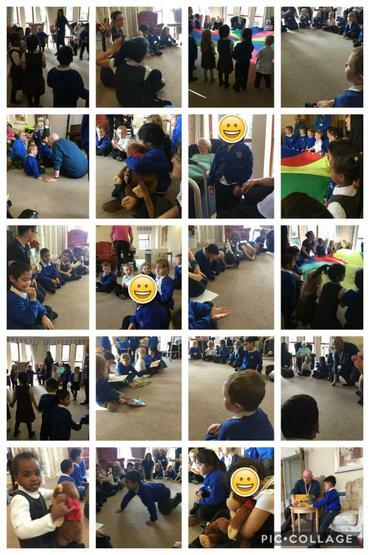 On Monday we had a stay and play with our grown ups where we looked at our online learning journals, this was so much fun as we got to share all of the amazing work we do with them! 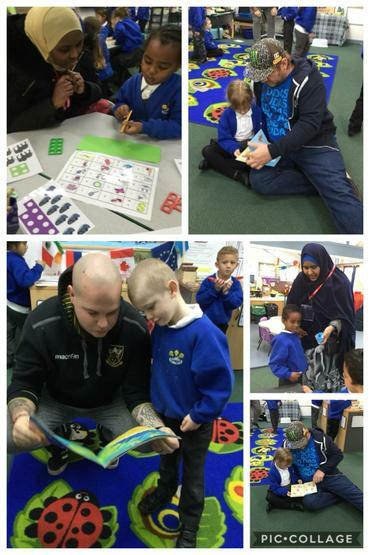 We also had a boys, books and brunch day and some of our grown ups stayed to read lots with us and share the importance of reading for fun! The saints also came to join us to share why they love reading so much and how important it is in their job roles! We have also been very busy outside again this week, we have added to our tunnel and came up with a new way to move through it. We also spent a long time building giant towers and problem solving how to get to the top of the tower. We have also loved learning our magic porridge story and have already started to change it to make it our own. 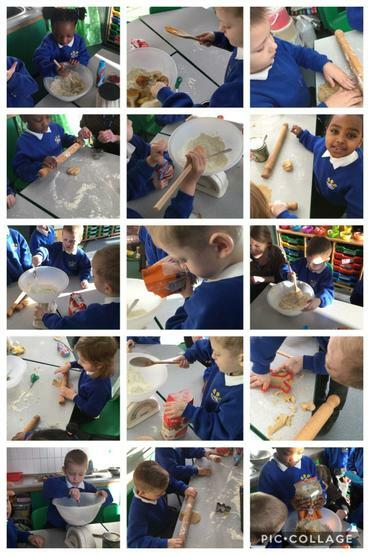 We have enjoyed tasting porridge and exploring porridge play dough and reading lots of other books that involve porridge! We can't wait to see what other innovations you all come up with next week! 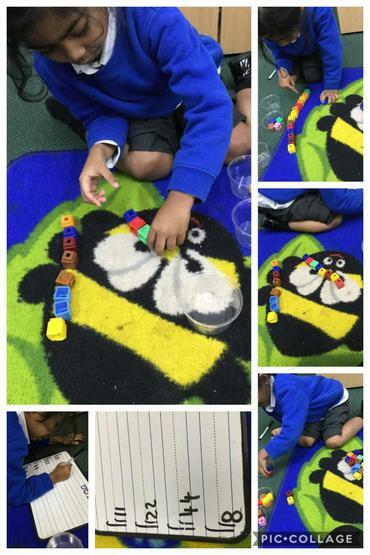 Counting, Writing, acting and more! This week we have been very busy. We visited the life education bus which was very exciting. We learnt lots about our bodies and what we need to do to give ourselves lots of energy! We even met a doll that lit up and showed us loads of different body parts, we were amazed. 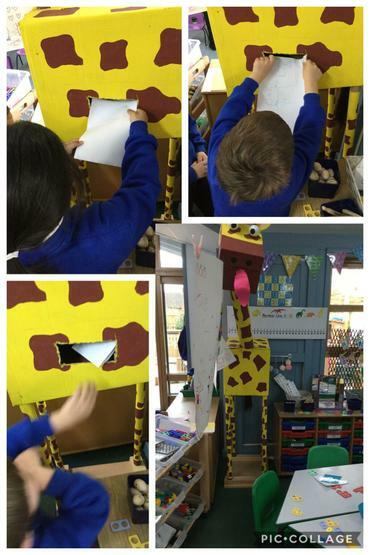 We especially loved meeting Harold the giraffe. We spent quite a bit of time outside this week as well. 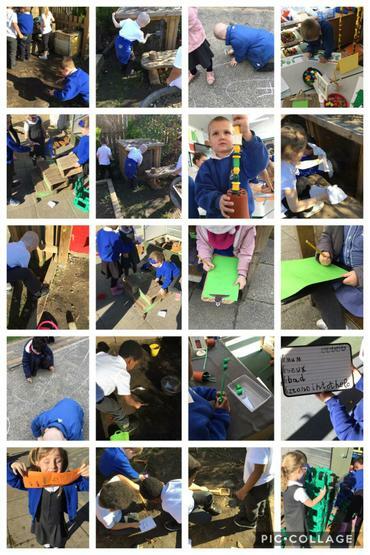 We loved exploring the construction resources and decided to build an animal shelter for the animals who live in our garden. We were inspired by the pigeon earlier on in the week who entered our classroom to say hello. We worked for ages and used great team work to hare thoughts and ideas. We were also very interested in numbers this week and we found lots of number cards. We worked as a whole class to order these numbers into a number line. Once we had completed this we moved onto finding the number of objects for a chosen number and matching them on our line! We have also learnt a new story this week, The Magic Porridge Pot! We can already retell our new story and we began to unpick it. We stating things we liked about our story and things we didn't like. We drew our story maps and some of us already innovated our story. We're so exciting to see what other work comes fro our story next week! This week in reception we have been thinking a lot about what we have to be thankful for. We thought about why we wear poppy's and what they mean. 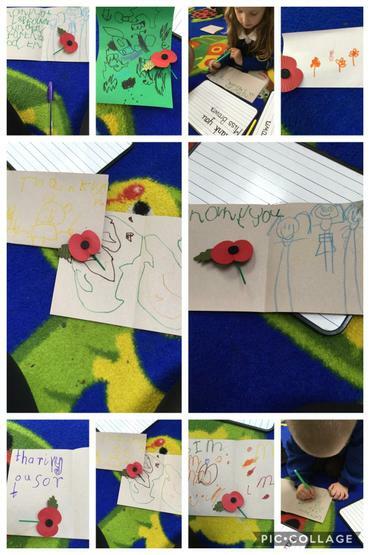 We then went around our circles holding a poppy one at a time and said something we are thankful for. Lots of us were thankful for our grown ups at home for making us food and taking us to school. We have also come on so much with our phonic knowledge this week and we are starting to write lots of different words and trying our best to sound out what we want to write. We have also spent a lot of time outdoors this week, our garden has been covered in glitter from us painting the garden. We have also found lots of spiders this week and enjoyed looking at them closely with our magnifying glasses. Tomorrow there is something special waiting for us in our classroom. Keep your eyes peeled on twitter to see what has arrived!! 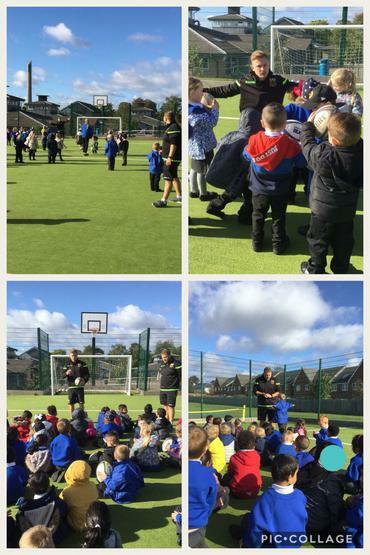 This week was our first week back after the half term holiday. We all came back so happy and confidently, it was lovely to see! This week we had some new visitors in our classrooms. There was Gerald the giraffe and Edgar the elephant!! we really enjoyed discussing with our friends how we thought they got here and why they were here! 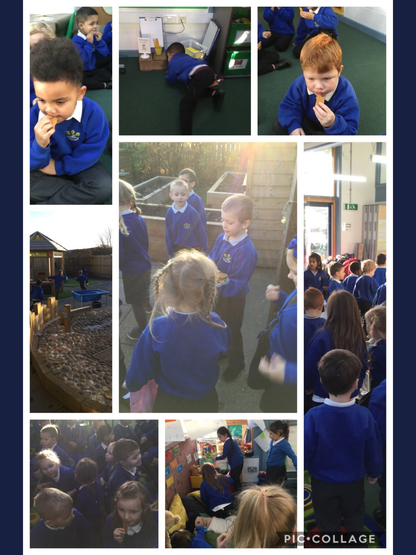 We also enjoyed the change in weather this week, we were able to observe the changed to our environment. 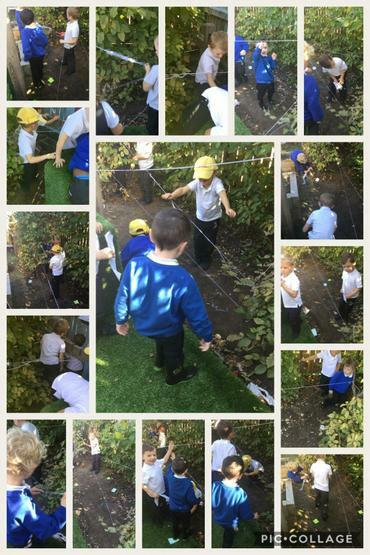 We noticed that there was ice appearing in our garden! This excited us very much and we had lots of science experiments to discover how to make ice! We then came up with a way to represent our own ice, we filled buckets with glitter and water and covered our garden in lots of sparkles!! We also had Boogie Beats to come into our school this week who brought some very special visitors from the residential home across the road from our school. We all sang and danced together to lots of different stories. What a fun filled week!! We are so excited for the term ahead. We are looking forward to hearing about fireworks spotted this weekend and the different sounds and colours we have seen. Don't forget you can upload lots of pictures onto tapestry for your child to share with their friends at school!! We can't wait to see them all!! Stories, stories and more stories!! This week in reception we have been so engaged with stories again! Reading them, writing them and performing them! We even made up stories about our junk modelling creations! they were everywhere! We also enjoyed exploring height this week and in maths we lined up from the smallest member of our class all the way to the tallest. We chose the smallest member to draw around and then measure using cubes. We discovered that our smallest member was 52 cubes tall which meant the rest of us were all taller than 52 cubes!! 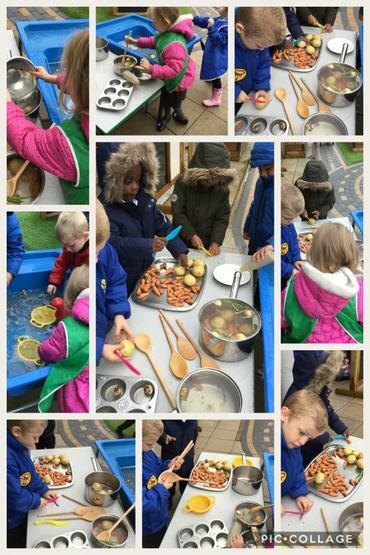 We also loved making our own autumn soup! we used chopping skills, cutting skills and stirring skills to create a yummy dinner! 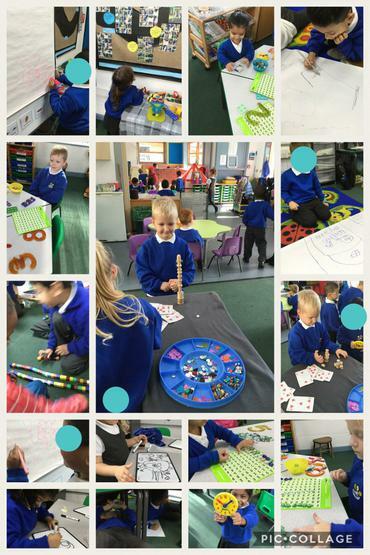 We worked so well as a team sharing our resources and describing what we could see. This week in reception we have carried on our huge interest in story telling! 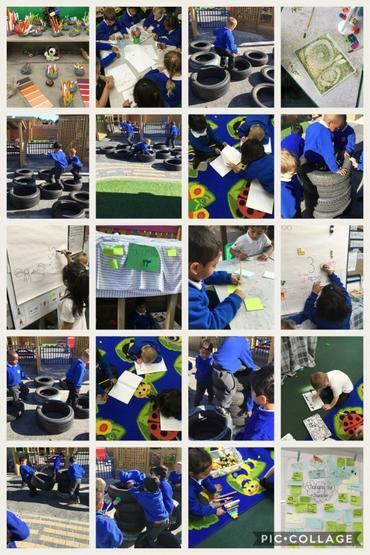 We now have our own story telling/mapping area in our classroom and it is very popular! We have had stories with lots of amazing story telling language such as once up a time, he walked and he walked and he walk and the end. All of the teachers were so impressed with our growing knowledge. 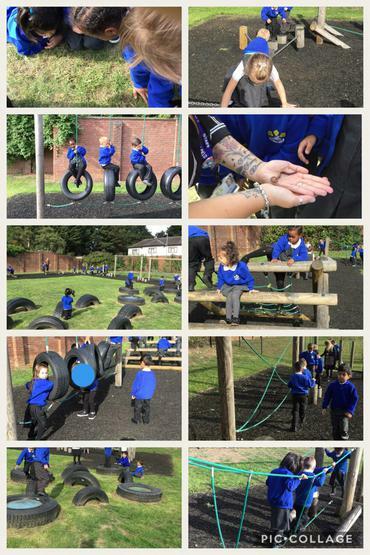 We also loved being outside this week and we became engaged in a wonderful idea from one of the boys. We found some wool in the garden and started to walk around with it through the trees, we soon realised that this made barriers. We started to call them lasers and soon lots of others joined us!! 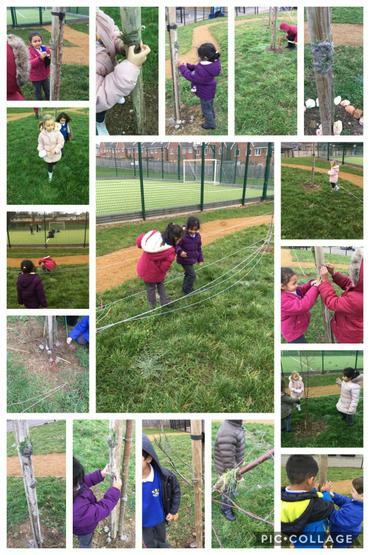 We used loads of team work, tying skills and cutting skills. 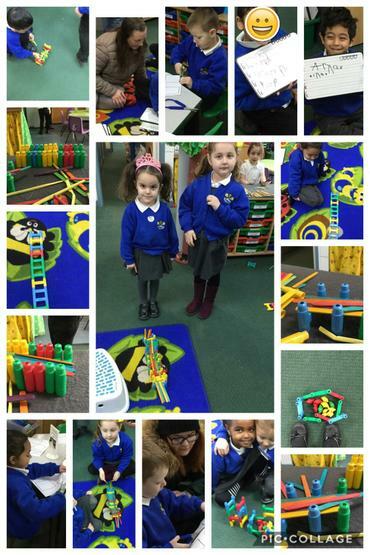 This week in reception we have been amazing authors (if you haven't already please go and look at our twitter page!) we have created so many new stories and performed them in lots of different ways. Some of use performed our stories using story spoons, puppets or our friends. Some of us sang our stories and stood in front of the whole class! We spent some time hot seating our characters and doing some drama! we loved acting as our characters and it gave us the confidence to come in front of the class (even the very shy children). We also explored the changing seasons this week an discovered what signs mean it is now autumn. We went out into our community for a walk to the park and collected lots of leaves, conkers and acorns. We discovered that these things were sings that autumn is here! We also sang out song for everyone to here "autumn leaves are falling down!" This week we have settled in so well and have loved joining up as a whole unit. There were 60 of us in this week and we were all super grown up and ate lunch in the big hall! We had loads of fun! Now we now our environment a bit better we were able to explore deeper and investigate things little bit closer. We were especially over joyed with our new lawn mower!! 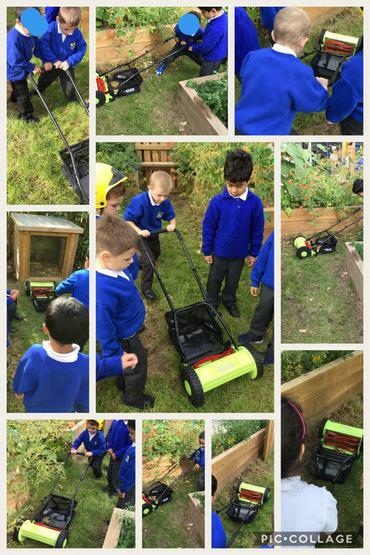 We used out strong muscles to help out and cut all of our grass in the garden, we were very good at turn taking and cheering our friends on. 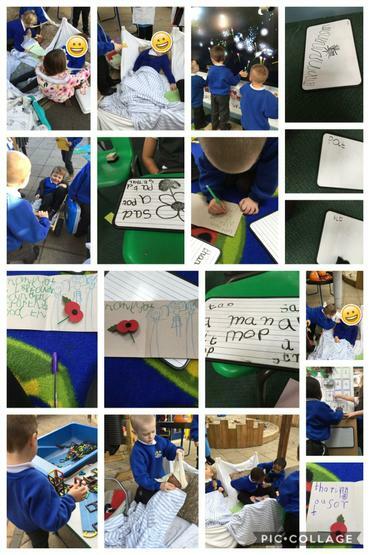 We have just read our new T4W (Talk for Writing) story 'The Little Red Hen' some of us have been joining in already with some of the words and actions! We can't wait for you all to come in and learn deeper whilst explore and playing with our new story next week! 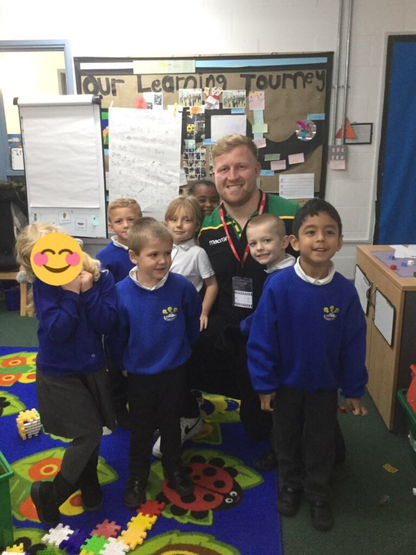 Today we also had the saints come in and talk to us all about rugby! 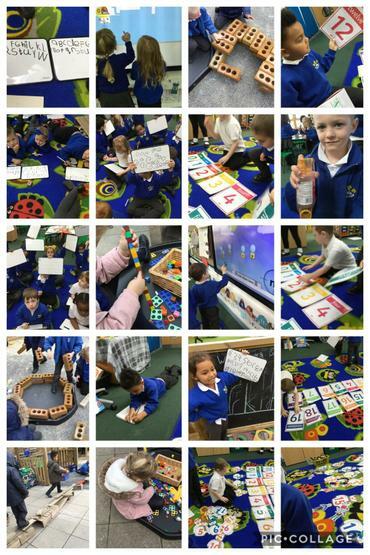 We loved the new games they taught us and we listened and followed their instructions beautifully. When we got back to the class room a lot of us said our favourite part was all of it! Take a look at what we will be learning during the Autumn Term!! We are learning new sounds in Phonics, we will be focusing on s,a,t,i,p,n to begin with. Please use these songs at home to help your child learn the sounds. Here are some top tips and benefits of talking with your young child. Talk to your child when you’re playing together. Get into their zone and talk about what they are looking at or playing with – they will learn language faster that way. Encourage your child to listen to different sounds, such as cars and animals. This will help your child’s listening skills. Gain your child’s attention when you want to talk. Talk about things as they happen, e.g. when you’re both unpacking the shopping. Listen carefully and give your child time to finish talking. Take turns to speak. Always respond in some way when your child says something. Try and have special time with your child each day to play with toys and picture books.